The Stitchery is the Home of the Counted Cross Stitch with cross stitch supplies, needlepoint, crewel embroidery, quilting supplies and hundreds of other projects and supplies for stitching lovers both young or old! Your savings will be applied automatically at checkout on The Stitchery website. 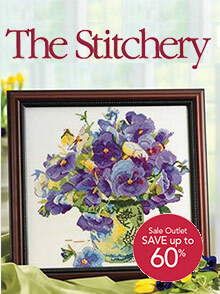 Cross Stitch catalogs - You're going to have to face it, you're addicted to Cross Stitching. If you're addicted to Cross Stitching, you will find yourself addicted to The Stitchery catalogs featuring a dream supply of expert cross stitch supplies! Create hundreds of handsome cross stitch designs with counted cross stitch patterns and counted cross stitch kits for hours of creative stitching! Cross Stitch supplies - Whether you prefer Stamped or Counted Cross Stitching, The Stitchery has the cross stitch supplies that cover all of your bases. For Stamped Cross stitch projects you will find Stamped Cross Stitch Kits from adorable Cat Cross stitch kits to festive Christmas cross stitch patterns. You will also enjoy a selection of stitching accessories from floor frames to magnifers, sewing lamps, needlecases, tape measures, and scores of other items that will make your stitching project easier. Quilting supplies - Find a quilting supply from The Stitchery that will prepare you for any professional Quilting Bee! Find quilting kits, quilting patterns and quilting supplies from a quilting hoop to quilting scissors, plus storage cubes and cabinets to house all of your quilting supplies! The Stitchery has the quilt patterns and supplies for quilting that will get you on the road to eternal quilting bliss! Embroidery supplies - The Stitchery Cross Stitch Catalogs will keep you stocked in embroidery stitches with crewel embroidery kits, and vintage Embroidery patterns that are lovely enough to frame! Craft yourself or loved ones embroidered pillows, table runners and shirts that will leave a beautiful embroidered design sewed with your own two hands! With cross stitch, needlepoint and quilting supplies a-plenty, you will always find the quilting and cross stitch supplies you need to get the job done beautifully, from The Stitchery Cross Stitch catalogs.